B.C. 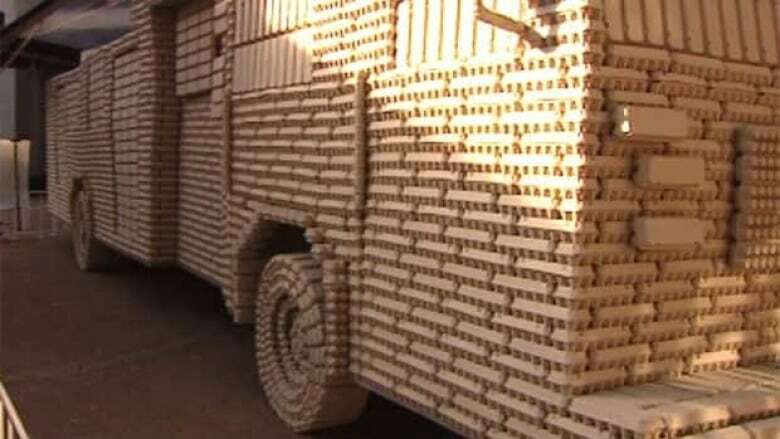 egg farmers say they're losing more than $3 million a year because an increasing number of consumers are buying their eggs in the U.S.
To illustrate its frustration, the board unveiled on Wednesday a life-sized fire truck it had made out of thousands of egg cartons, equivalent to those that would contain the 24 million U.S. eggs sold to Canadian cross-border shoppers every year. In the Lower Mainland, a dozen eggs can be bought for $3.19. The retail price in Washington is about $2.09. Board spokeswoman Ann-Marie Butler says B.C. producers can't compete with low production costs in the U.S.
"We have 2.7 million chickens that are with our registered producers. In the U.S., that would be one farm," Butler said. There are more than 130 commercial egg producers in B.C., with average flocks of about 17,000 chickens. The province’s largest single egg distributor is Golden Valley, which says it’s seeing a slight but "concerning" decline in the market. One of the smaller producers is Capella Farm, which is selling half the eggs it used to. "[Consumers] have to support the farmers here in B.C.," said Mariam Barcarel, of Capella. "We are doing this for them. They are good products."